The Cook Islands (Cook Islands Maori: Kūki 'Āirani) are a self-governing parliamentary democracy in free association with New Zealand. The 15 small islands in this South Pacific Ocean state have a total land area of 92.7 square miles (240 sq km). National defense is the responsibility of New Zealand, in consultation with the Cook Islands and at its request. The Cook Islands has developed an increasingly independent foreign policy, particularly after the adoption of an isolationist and non-aligned policy by New Zealand in the 1980s. The Cook Islands are a group of 15 islands in the southern Pacific Ocean, about half-way between Hawaii and New Zealand, spread out over about 900 square miles (1400 sq km). The northern Cook Islands are seven low-lying, sparsely populated coral atolls—Manihiki, Nassau, Palmerston Island, Penrhyn Island (also known as Tongareva), Pukapuka, Rakahanga, and Suwarrow. The southern Cook Islands consist of eight elevated, fertile volcanic isles where most of the populace lives–Aitutaki, Atiu (Enua-Manu or Island of Birds), Mangaia, Mauke, Rarotonga (the location of the capital, Avarua), Manuae, Mitiaro, and Takutea. The Cook Islands have a tropical climate moderated by trade winds. The mean annual temperature is 75°F (24°C). The highest point is Te Manga, located on Rarotonga (the largest of the Cook Islands at 26 square miles or 67 sq km); its elevation is 2,140 feet (652 m). Nine percent of the land is arable, with 13 percent in permanent crops; the remaining 78 percent is in other uses. Average annual rainfall ranges from 79 to 118 inches (2000 to 3000 mm). Located in the "Cyclone Belt," cyclones and typhoons pose the only natural hazards. The northern Cook Islands were probably settled around 800C.E. by immigrants from Samoa and Tonga, while the southern group’s inhabitants are descended from voyagers from the Society Islands and the Marquesas. The Spanish navigator Álvaro de Mendaña sighted the island of Pukapuka in 1595. Another Spaniard, Pedro Fernandez Quiros, landed at Rakahanga in 1606. English explorer Captain James Cook landed at numerous islands in the southern group between 1773 and 1779 and named them the Hervey Islands. The name Cook Islands was first used in the early 1800s on Russian naval charts. In 1823, the English missionary John Williams, of the London Missionary Society, introduced Christianity to Rarotonga. In 1843, the ariki (chiefs) of the Cook Islands requested protection from Britain against French attack. In 1888, after further petitions, the Cook Islands were made a protectorate of Great Britain. They were transferred to New Zealand in 1901, and remained a New Zealand protectorate until 1965, at which point they became a self-governing territory in free association with New Zealand, remaining a member of the British Commonwealth. The Cook Islands elected Albert Henry of the Cook Islands Party as their first prime minister in 1965. He was succeeded in 1978 by Tom Davis of the Cook Islands Democratic Party. 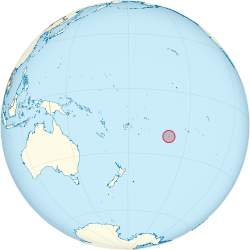 On June 11, 1980, the United States signed a treaty with New Zealand specifying the maritime border between the Cook Islands and American Samoa; the U.S. also relinquished its claim to the islands of Penrhyn or Tongareva, Pukapuka (Danger), Manihiki, and Rakahanga. The Cook Islands are a parliamentary representative democracy. The chief minister is the head of the cabinet and oversees the daily operation of the government, and of a multi-party system. Executive power is exercised by the prime minister and the cabinet. Legislative power is vested in the Parliament of the Cook Islands, acting with the advice of the House of Ariki, the Hereditary Chiefs Council. The judiciary, in the form of the High Court, is independent of the executive and the legislature and is led by a chief justice appointed by the Queen's Representative to the Cook Islands, together with the prime minister. New Zealand retains some responsibility for external affairs, in consultation with the Cook Islands. In recent years, the Cook Islands have taken on more of their own external affairs and, as of 2005, have diplomatic relations in their own name with 18 other countries. Like other South Pacific island nations, the Cook Islands' economic development is hindered by the distance from foreign markets, the limited size of domestic markets, lack of natural resources, periodic devastation from natural disasters, and inadequate infrastructure. Agriculture provides the economic base. The main subsistence crops are cassava, sweet potatoes, and other vegetables. Copra (dried coconut meat) and citrus fruit are the main exports. Manufacturing activities are limited to fruit processing, clothing, and handicrafts. Trade deficits are offset by remittances from emigrants and by foreign aid, largely from New Zealand. In the 1980s and 1990s, the country maintained a large public service sector and accumulated a large foreign debt. Subsequent reforms, including the sale of state assets, the strengthening of economic management, the encouragement of tourism, and a debt restructuring agreement, have rekindled investment and growth. Exports totaled US$9.1 million in 2000. Export commodities were copra, papayas, fresh and canned citrus fruit, coffee, fish, pearls and pearl shells, and clothing. Export partners were Australia (34 percent), Japan (27 percent), New Zealand (25 percent), and the United States (8 percent) in 2004. Imports totaled US$50.7 million in 2000. Import commodities were foodstuffs, textiles, fuels, timber, and capital goods. Import partners in 2004 were: New Zealand (61 percent), Fiji (19 percent), the U.S. (9 percent), Australia (6 percent), and Japan (2 percent). Per capita GDP was just US$5,000 in 2001, and the unemployment rate was 13 percent in 1996. Tourism is the country's leading industry, and the strongest element of the economy, far ahead of offshore banking, sale of international fishing licenses, pearls, marine, and fruit exports. By 2006 some 21,388 people were living in the Cook Islands, more than half of them on Rarotonga. But only 13,500 were permanent residents. About 51,000 live in New Zealand, 70 percent were born there, and 42 percent were under the age of 15. About 15,000 Cook Islanders live in Australia. With most of the population living away from the islands, efforts to preserve language and culture are underway in expatriate communities, as well as in the homeland. Cook Islanders are Polynesians. Ethnic groups in the 2001 census were: Cook Island Maori, 87.7 percent; part Cook Island Maori, 5.8 percent; other, 6.5 percent. Cook Island Maori belongs to the family of Oceanic languages, a sub-branch of the Austronesian language family. English is the official language while Cook Island Maori is also in use. Among the best educated of the South Pacific Islanders, most Cook Islanders are bilingual, and literate in both languages. The London Missionary Society introduced Christianity to the Cooks in the early 1800s. In the 1970s, the Cook Islands Christian Church was formed from the London Missionary Society. Cook Islands Christian Church claims 55.9 percent of the population; Roman Catholic Church 16.8 percent; Seventh-day Adventists 7.9 percent; Church of Latter Day Saints 3.8 percent; other Protestant 5.8 percent; other religions 4.2 percent; unspecified 2.6 percent; and three percent say they have no religion. As in other Polynesian islands, the Cook Islands' pre-European culture was a chiefly system based on traditional legends of migration and settlement. These stories enshrined the power of the chiefs as inheritors of a "heroic" culture, similar to that of the heroic period of Greece around 1200 B.C.E. The Polynesian hero acquired mana, meaning “power” and “prestige” by the deeds he accomplished. Allegiance to chiefs was fundamental. The chiefs' titles were passed down through the senior male line, while land rights were inherited via the mother's line. Chiefs were responsible for war leadership, carrying out important discussions with other groups or clans, land allocation, dispute settlement, and intercession with the gods. A chief organized and paid for feasts. A chief, or indeed, any man, was judged by his ability and willingness to bestow gifts and to host festive gatherings. The Cook Islands has a total of 23 government-run schools, eight of which are on Rarotonga and 15 of which are spread out among the nine outer islands of Aitutaki, Atiu, Mangaia, Manihiki, Mauke, Mitiaro, Nassau, Penrhyn (Tongareva), and Pukapuka. Literacy is 95 percent. The University of the South Pacific has a campus on Rarotonga. Imene tuki and imene metua are forms of unaccompanied vocal music known for a uniquely Polynesian drop in pitch at the end of the phrases, as well as staccato rhythmic outbursts of nonsensical syllables known as tuki. There is much variation across the region, and each island has its own traditional songs. There are numerous Polynesian string bands which play at restaurants, hotels, and concerts that combine modern electronics with traditional ukuleles fashioned from coconut shells. In the Cook Islands, Christian music is extremely popular. Harmony-singing church music and a wide variety of hymns, wedding, and funeral music are found throughout the Cook Islands. Traditional dance is the most prominent art form. Each island has its own unique dances that are taught to all children, and each island is home to several annual dance competitions. Traditional dances are generally accompanied by the drumming of the paté. The Cook Islands drumming style is well-known internationally, but is often misidentified as an example of Tahitian music. The art of drumming has existed for hundreds of years in Aitutaki, Manihiki, Pukapuka, Mangaia, and Tongareva. Carving does not have the spiritual and cultural emphasis given to it by the Maori in New Zealand. Atiu has a strong tradition of crafts both in carving and local fiber arts such as tapa. Mangaia is the source of many fine adzes carved in a distinctive, idiosyncratic style with the so-called double-k design. From Mangaia come food pounders carved from the heavy calcite found in its extensive limestone caves. “Tivaevae” (tivaivai) is the popular art of making handmade patchwork quilts. Introduced by the wives of missionaries in the nineteenth century, the craft grew into a communal activity. Cook Islands writers include Stephen Savage, a New Zealander and a public servant, who compiled a dictionary late in the nineteenth century; Robert Dean Frisbie, a Californian writer who, in the late 1920s, sought refuge from the hectic world of post-World War I America and wrote numerous magazine articles and books on the island; and Ronald Syme, founder of a pineapple canning enterprise on Mangaia, and author of "Isles of the Frigate Bird" and "The Lagoon is Lonely Now." ↑ Central Intelligence Agency, Cook Islands The World Factbook. Retrieved January 11, 2012. ↑ United Nations, The World Today and Repertory of Practice of United Nations Organs Supplement No. 8; page 10 Retrieved January 11, 2012. This page was last modified on 23 March 2017, at 14:40.